Hempress Utopia Healing Sanctuary: Where Healing of the Mind/Body/Spirit is achieved through spiritual awareness and re-awakening. To visit the Hempress Utopia--click here. Hempress Utopia Healing Sanctuary not only launches in full mode today but also adds such great magnetism to the healing world. Let all of the angelic forces rejoice as the World inhales the breath of the Divinity that inspires the Sanctuary and her wholeness. 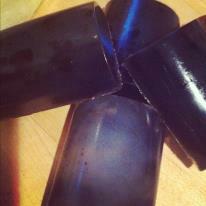 Pictured here are the Blue Dream soaps from my GoddessBody soap collection. These soaps aid in third eye chakra (pineal gland) cleansing as well as dream-work. Other healing soap collections include: Queen/Womb Care, Luxury King, AFRodisiac, Eternal Beauty and Pain Relief. You can browse all categories by clicking here and if you are a PayPal user, you can order these soaps directly from your PayPal account by clicking here here. As always, the Hempress Utopia Healing Sanctuary is always finding alternative healing methods through ancient high science, love, care and alchmey. Be unafraid, because our consciousness truly knows no boundaries. Believe in all things, seen and unseen, and Life's mystery shall reveal. With Love, and Peace, eternally. Naree' Renelle. Moon Priestess.